To provide unambiguous mRNA decoding during translation, aminoacyl-tRNA synthetases should possess an extremely high specificity when selecting amino acids and tRNAs as substrates. In the case of amino acid selection the enzyme has to discriminate between substrates, which sometimes possess very similar structures, such as isoleucine and valine. The error rate in tRNA aminoacylation is indeed extremely low, and even for related amino acids, e.g. isoleucine and valine, it does not appear to exceed one per 10,000 under normal physiological conditions. Val-tRNAIle:IleRS + H2O —»-Val + tRNAIle + IleRS. This implies that the enzyme has a second chance to discriminate between the aminoacyl residues, now in the form of their ester derivatives; if the residue is noncognate, then the water molecule is activated and the ester bond is attacked. In the case of the hydrolysis of valyl-tRNAIle by IleRS, the free hydroxyl of the tRNA terminal ribose has been seen to play an important part. In some other cases a different correction (proofreading) mechanism may be in operation, when a noncognate aminoacyl adenylate is hydrolyzed by the enzyme prior to the transfer of the aminoacyl residue to tRNA. 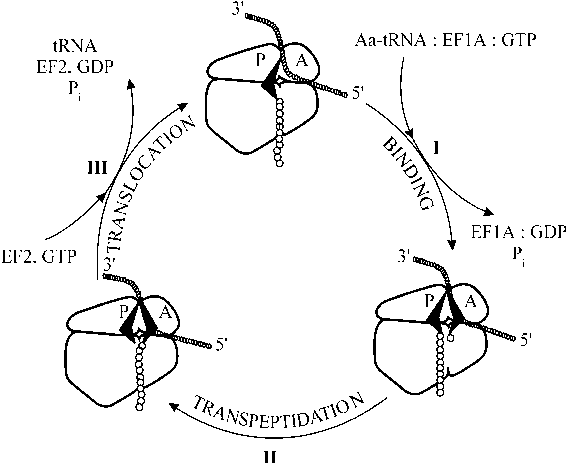 It has already been stated that the binding of tRNA with ARSase is a multi-step process. The initial tRNA binding is not very specific, and so the enzyme may interact with a number of noncognate tRNAs. The IleRS, for example, can bind tRNAVal, and its binding is only one-fifth the strength of the binding of the cognate tRNAIle. The enzyme interacts with tRNAGlu as well; this latter binding, however, is 10,000 times weaker than the binding of the cognate tRNAIle. Generally, very different affinities are found for various combinations of ARSases with noncognate tRNA species, from an almost total absence of affinity to an affinity close to that of the cognate tRNA. The affinity of the enzymes to tRNA usually increases with the decrease in pH and ionic strength and is stimulated by organic solvents; this suggests that ionic interactions contribute considerably toward binding. Correspondingly, the same factors stimulate the nonspecific binding of tRNA by ARSases. Magnesium ions, however, frequently have the opposite effect: they may decrease the binding of noncognate tRNA species to an ARSase, i.e. increase binding specificity. The latter effect is usually considered to be the result of the action of magnesium ions upon the conformation of both the enzyme and tRNA. (ARSaseAa-AMP:tRNA)'' —»"ARSase Aa-tRNA + AMP. This mechanism, however, is not universal for all ARSases. For example, the TyrRS from E. coli and the SerRS from yeast, as well as the ArgRS, show a very high specificity even at the stage of the initial complex; they bind little of the noncognate tRNA species. Regardless of which mechanism is realized, the final result is a very high specificity of the selection of tRNA by the enzyme. This raises the problem of the specific tRNA-protein recognition. It is apparent that certain specific regions of the tRNA molecule are involved in this recognition. There are two major regions of tRNA molecule which are in most cases directly involved in the recognition by the enzyme: the acceptor stem and the anticodon. This is not a general rule, however. For example, such tRNAs as tRNAAla and tRNASer are recognized by their cognate synthetases without participation of their anticodons, mainly by specific binding of the acceptor stem. On the other hand, tRNAMet seems to be specifically recognized by its synthetase predominantly at the anticodon. The acceptor stem is involved in the recognition in most cases of tRNA-ARSase interactions. The base of the forth nucleotide from the 3' end (position 73) is often designated as a "discriminator base" (Crothers et al., 1972), because it divides tRNAs into four recognition groups: A73 must be present in tRNAs specific for Ala, Arg, Ile, Leu, Lys, Pro, Tyr, Val; G73 in tRNAs for Asn, Asp, Gln, Glu, Trp; C73 in tRNAHis; and U73 in tRNACys and tRNAGly. Further discrimination may be determined by the end-proximal base pairs. For example, the presence of the pair G3:U70 in the acceptor stem determines the recognition of the tRNA by AlaRS (provided A73 is present). For the recognition of tRNAGln by the cognate synthetase the stem should include the pairs U1:A72, G2:C71 and G3:C70, in addition to the unpaired "discriminator" G73. The recognition at the acceptor stem is considered to be the earliest in evolution of ARSases. The anticodon is the second major site of the recognition of tRNAs by ARSases. In some tRNAs all three nucleotides of the anticodon seem to be important for the recognition (e.g., tRNAAsp, tRNACys, tRNAGln, tRNAMet, tRNAPhe, tRNATrp), whereas in others just one (C35 in tRNAArg) or two anticodon residues (C35C36 in tRNAGly , A35C36 in tRNAVal) are known to be essential for the recognition. The tight interaction of the ARSase with the acceptor stem and the anticodon may induce serious conformational distortions in these regions of the tRNA molecule. The tRNAGln, when interacting with its cognate GlnRS (a representative of class I synthetases), changes the "classical" conformation of the 3' single-stranded terminal sequence (Fig. 3.14): now the strand makes a hairpin turn toward the inside of the L, with the disruption of the adjacent base pair of the acceptor stem. The anticodon loop of tRNAGln in the complex with the synthetase also adopts an unusual structure: the middle anticodon base U35 becomes stacked with the anticodon adjacent base A3 7, whereas the C34 and G36 of the anticodon are unstacked and project outward to interact with the corresponding protein groups (Rould et al., 1991). It seems likely that the structure distortions of this type are typical of interaction of class I synthetases with their tRNAs. Figure 3.14. Superposition of the phosphate backbone of uncomplexed yeast tRNAPhe ("classical" tRNA structure, filled circles; see Figs. 3.8 and 3.10) on that of the tRNAGln (filled squares) complexed with the GlnRS. Major differences are seen in the acceptor strand conformation, the anticodon loop, and the width of the grooves of the acceptor stem and anticodon stem. (Reproduced from M.A. Rould, J.J. Perona, D. Söll & T.A. Steitz, Science 246, 1135-1142, 1989, with permission). 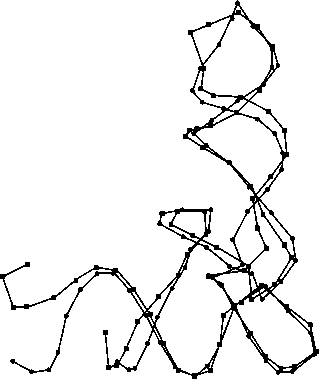 acceptor stem helix. The anticodon loop, however, undergoes a large conformational change in order to bind with the contacting protein groups: the U-turn conformation is disrupted with a concomitant unstacking of all the anticodon bases, and the loop as a whole is moved toward the inside of the L (Cavarelli et al., 1993). In addition to the ordinary tRNA species which accept amino acids and then immediately transfer them to ribosomes, there are peculiar tRNAs presenting their aminoacyl residues for enzymatic modification, prior to participation in translation. Met-tRNAiMet + N10-Formyltetrahydrofolate-F-Met-tRNAiMet + Tetrahydrofolate. The enzyme is highly specific and attacks only Met-tRNAfMet. (For review see RajBhandary & Chow, 1995). Glu-tRNA + Glutamine + ATP-»-Gln-tRNA + ADP + Glutamic acid + P.. Since this tRNA species recognizes glutamine codons, it is designated as tRNAGln, despite the fact that it is aminoacylated by GluRS. (For review see Verkamp et al., 1995). (For review see Baron & Boeck, 1995).